UPDATE: Wow, check out the related posts below. So many flips in the Mission! 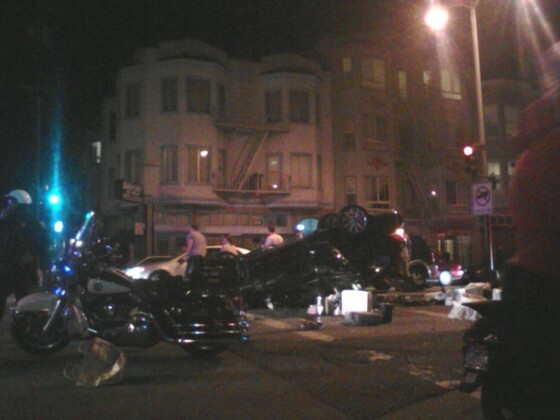 How Did This Luxury Automobile Flip Over on Valencia? the boatload of stuff was actually PULLED out of the trunk by good samaritans trying to save the driver’s life by clearing out a path inside the car…. It was at 19th St. Saw the lights but somehow missed the giant crash. I saw it. The SUV actually pushed the flipped car a second time to get it out of his lane to run away. Total a-hole.